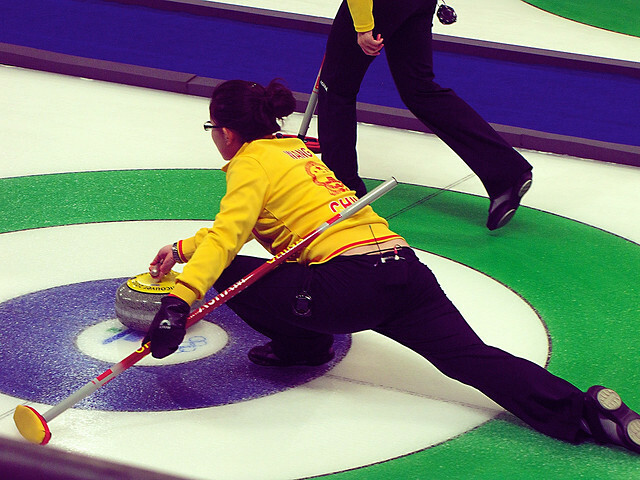 The curling world has recently been swept into debate over the role of new brooms. Even outlets such as Yahoo Sports and The Washington Post have reported about it. As a relatively new curler (I started a little over a year ago out of the San Francisco Bay Area Curling Club), and an early scholar studying people’s perceptions of and social effects of new technologies, this struck me as a particularly interesting debate, even if I’ve been watching this from a bit of a distance. In the game, 1 player delivers a rock by pushing it down the ice. 2 other players sweep with brooms to guide the stone down the sheet of ice towards a particular position at the other end. Rocks curl as they travel, moving in an arced path. Sweeping with brooms reduces friction on the ice and makes the arced path straighter. This allows stones to move further and straighter. While sweepers can adjust the path of the rock to some degree, the path the rock takes is predominantly determined by the person delivering the rock. This person must deliver at the correct initial angle and speed, requiring precision and skill. The technologies of brooms have changed over time. We’ve moved from classic corn brooms to brooms with horsehair brushes, to synthetic nylon pads (that visually resemble something more akin to a mop or Swiffer). And these pads have improved over time too, with different companies offering specialized designs. For example, the Goldline Norway pad uses a waterproofing layer under the fabric (wet pads are less effective at sweeping), and has small ridges which reduces sweeping friction and help cleans dirt in the rock’s path. The BalancePlus EQ pad reflects more heat back to the ice and are also waterproofed. But about a month ago, in early October 2015, a new type of broom pad caused debate and controversy among many in the curling community. Broom pads made by BalancePlus with “directional fabric,” as it has been dubbed, can direct stones in almost zig-zag-like directions with “magical” precision, rather than the normal arced path. This means the precision and skill needed to deliver or throw the rock diminishes greatly. Instead, sweepers can direct the rock almost anywhere they want it to go. While “directional fabric” heads have been available for some time now by other companies, the BalancePlus version took it to a new level, exaggerating the directional qualities available in other companies’ brooms. At the time, there were no formal rules banning the use of these types of brooms. Nor are there many formal rules on equipment players can use in general. 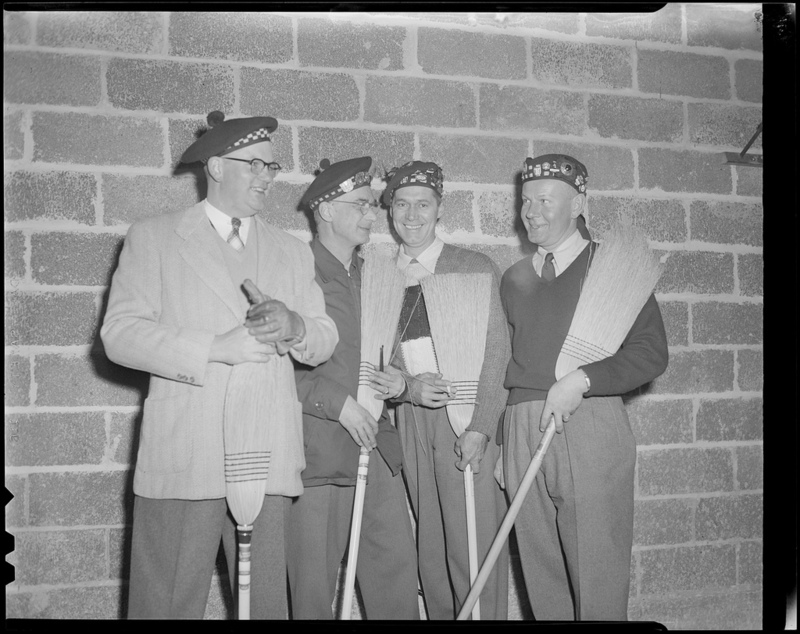 There were calls to ban the brooms, many calling them unfair, or not in the spirit of curling. Many top level players signed a statement saying that they would not use the brooms. And on November 6, the World Curling Federation banned the brooms for the Pacific-Asia Curling Championships. Many people speculate more formal rules may be forthcoming, especially given the lead up to the 2018 Winter Olympics. But one thing in particular really stands out to me. BalancePlus, the manufacturer of these brooms, itself called for companies to stop using directional fabric, calling them bad for the game, and that they “were crafted in order to prove a point about how far curling technology can go and were never going to get to market.” Taking them at their word, it indicates that the design of these heads were deliberately provocative in order to make a point and generate discussion. Diving into the world of design, this seems similar to Dunne and Raby’s concept of “critical design,” that design can be pushed beyond reinforcing values of consumer culture but instead be used provocatively for cultural critique. The strategy of pushing existing trends to the extreme is one strategy of critical design, also used by BalancePlus. However, I wouldn’t go as far as calling these brooms as critical design – while intentionally provocative, they don’t go as far as cultural critique. Instead, I would call what they did something more akin to a provocative design intervention, or design provocation, as they do explicitly try to engage in what they see as a potentially troubling trend in curling technologies. In that sense, BalancePlus’ creation of these brooms with “directional fabric” was a success in provoking and jumpstarting a conversation. The Future of the Sport. Many people note the traction that the sport has gained in the Winter Olympics, particularly with the addition of a new curling event in 2018, Mixed Doubles. The sports’ popularity has also been growing in the US in recent years. Part of this is done by cultivating an image of skilled athleticism in curling – both in the throwing and sweeping of rocks. The ability to easily control rocks through sweeping with directional fabrics diminishes the amount of athleticism needed for both throwing and sweeping. These concerns endanger curling’s growing reputation among a broader outside audience that may already be quick to question curling’s status as a sport. The Spirit of Curling. Curling prides itself on being a moral and ethical sport. The rulebook is relatively slim. At the non-elite level games are self-called. There are no referees, and players are expected to call their own penalties. It’s a friendly and close knit community. Fairness in this sense goes beyond the rulebook, rather to the social norms of the game and the social norms of the curling community. And in many ways, these social norms are what draw people to curling. The conversation resulting from the broom contoversy reveals a pretty neat intertwining of technology (brooms), regulation (curling regulations), and norms (the spirit of curling). This is not a pure technical issue about brooms, but a debate that combines the technical issues of the brooms, current and possible future curling rules and regulations, and the norms among the curling community. Technologies, regulations, and norms are not separate entities, but deeply intertwined. And as seen, changes to one can provoke or push on the others. This similar to Jackson, Gillespie, and Payette’s Policy Knot, which looks at the ways design, policy, and practice are intertwined. Thus, while the “directional fabric” brooms may seem like a scary thing at first, when we think of it as an intentionally provocative and noncommercial design, it becomes pretty cool and does some good work for us. It has highlighted a potentially troubling developing in broom technology and jumpstarted a conversation about how to mitigate these potential problems before they become widespread. In an age where law and policy are often perceived to be “behind” technology development, more design provocations and conceptual designs can be good for starting these types of conversations early on, and for having nuanced discussions. Law and policy aren’t always the things to be “fixed” or changed (though sometimes they should be). Other times however, we may look at ways to change technologies or social norms as ways to regulate in the face of new developments. Provocative designs can help us anticipate and speculate the ways in which technologies, policies, norms, and people might interact (and react) in the future. And that’s definitely something we don’t want to just sweep away. ← Previous Post DQ: Distributed Trolling, Crime, or Activism?